The Scooby gang is revving up the Mystery Machine for a new live-action adventure in Scooby-Doo! Curse of The Lake Monster. Production began this week in Southern California for the follow-up to 2009’s Scooby-Doo! The Mystery Begins live-action movie. The Scooby characters fist appeared in the CBS TV show Scooby-Doo Where Are You! back in 1969. The series follows the animated adventures of four teenage kids and their big dog as they tried to solve spooky mysteries. The series lasted just 25 episodes but the characters have proved so popular that they’ve returned in 10 televisions series, seven TV specials/telefilms, and 14 made-for-video animated films. In 2002, Scooby and his meddling friends made the move to the big screen in a live-action movie called simply Scooby-Doo. The picture stars Freddie Prinze Jr. (Fred), Sarah Michelle Gellar (Daphne), Linda Cardellini (Velma), Matthew Lillard (Shaggy), and Neil Fanning (voicing the CGI canine). The movie earned $276 million worldwide, enough of a success to spawn another movie in 2004 with the same cast. The sequel, Scooby-Doo 2: Monsters Unleashed, brought in $181 million globally. Which version of Scooby-Doo do you prefer? 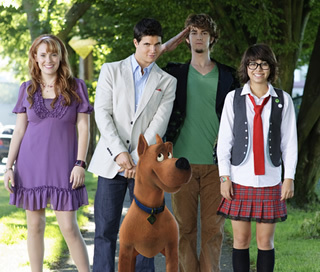 Last year saw the release of a live-action prequel, Scooby-Doo: The Mystery Begins, that was specifically made for Cartoon Network starring Robbie Amell (True Jackson, VP) as Fred, Kate Melton as Daphne, Hayley Kiyoko as Velma and Nick Palatas as Shaggy. Scooby-Doo once again appeared via computer-generated animation with Frank Welker supplying the voice. Welker’s been the voice of the animated Fred since the beginning and has been the voice of Scooby since 2002 (voice legend Don Messick died in 1997). The new movie reunites the cast for a new mystery. Scooby-Doo! Curse of the Lake Monster finds the Mystery Inc. gang heading toward summer jobs at a country club owned by Daphne’s uncle. There, the super sleuths stumble onto strange happenings around the local lake. Intrigue ensues, with clues provided by mystical moonstones, creepy characters and a frog monster who terrorizes the club. There’s plenty of mystery and romance in the air that only the fearful foursome-plus-one Fred, Daphne, Velma, Shaggy and Scooby-Doo can solve. The team behind the camera is a bit of a Scooby reunion as well. Returning from the first prequel picture are Brian Levant as director, brothers Daniel and Steven Altiere as script writers, and Brian Gilbert as the movie’s producer. The new Scooby-Doo movie will debut in Fall 2010 on Cartoon Network as part of the channel’s continuing work to create new movies and live-action projects. If you can’t wait that long, Cartoon Network currently airs past incarnations of the Scooby-Doo series. Will there be a sequel to Scooby Doo: Curse of the Lake Monster? If so, do you have information pertaining to the release date of the picture?